Two-time TEDxFIU speaker Dr. Aileen Marty has been to places “not on anyone’s bucket list.” Despite naysayers and fears of contagion, she has gone all over the world studying dangerous diseases like leprosy and plague. “If you have the skills and the training and the experience, and you are needed, you need to step up,” Esther Myers – wife of Marty’s mentor, Wayne Meyers – once told her. Marty did step up; and on Nov. 5, she shared from the TEDxFIU stage her and other health care workers’ experience fighting Ebola in West Africa during the outbreak earlier this year. The fourth annual TEDxFIU event, “Always Forward,” was held at the Wertheim Performing Arts Center and featured eight talks centered around a message of hope and optimism. The speakers exemplified this year’s theme, always facing problems head-on, no matter the challenges. From left to right: Jonathan Wynn-Strachan, Sakhrat Khizroev, Dr. Aileen Marty, Nelson Hincapie, Todd Crowl, Rhett Williamson, Dr. Carolyn Runowicz, Patricia and Chris Kayser. The show kicked off with a hip-hop performance by College of Architecture + The Arts student Reggie Baril, and continued with, Todd Crowl, co-founder of FIU’s Sea Level Solutions Center, who explained the problem of sea level rise, asserting that the next generation of scientists could find a solution. Children’s Advocate Nelson Hincapie shared his four decade journey in search for a life’s purpose and how he finally made peace with God. Graduate student Rhett Williamson gave the audience a behind-the-scenes look at forensic chemistry and his ink library database that will help investigators trace counterfeit currency. Student Jonathan Wynn-Strachan talked about how just a few years ago he was an honors high school student and homeless. Fueled by his passion for music and the wisdom of his mother, who he calls “The Philosopher,” he began a non-profit organization, 60 Minutes of Art, which brings art to children in underserved neighborhoods. Dr. Carolyn D. Runowicz, a gynecologic oncologist, and Sakhrat Khizroev, a physicist and electrical engineer, explained how nanotechnology could cure ovarian cancer. By using nanoparticles to target specific cancer cells while avoiding damage to healthy cells, the duo has eradicated cancer cells in mice. Marty showed how Ebola spread throughout the world because of the reckless actions of a few. Patricia sings, “I Am Your Voice, to her brother, Chris. And in the last talk of the night, student Patricia Kayser shared how music allowed her to truly connect with her brother Chris, who was identified as being on the autism spectrum at four years old. Kayser learned to play the guitar after seeing firsthand how music helped him become more social and interactive. She eventually started a non-profit organization, Autism & Music, to help others on the autism spectrum. 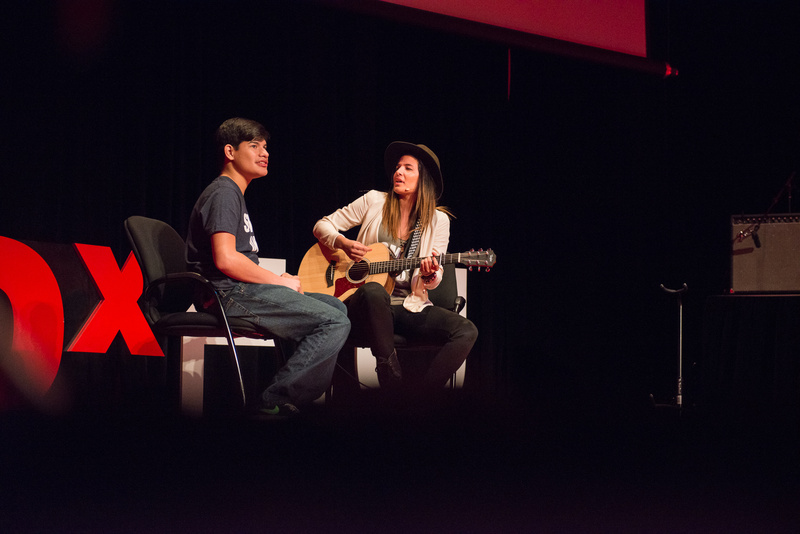 Kayser’s brother joined her on stage as she performed a song she wrote for him, “I Am Your Voice.” Chris clapped and cheered as she sang him the song and, more than once, he strummed the guitar strings. 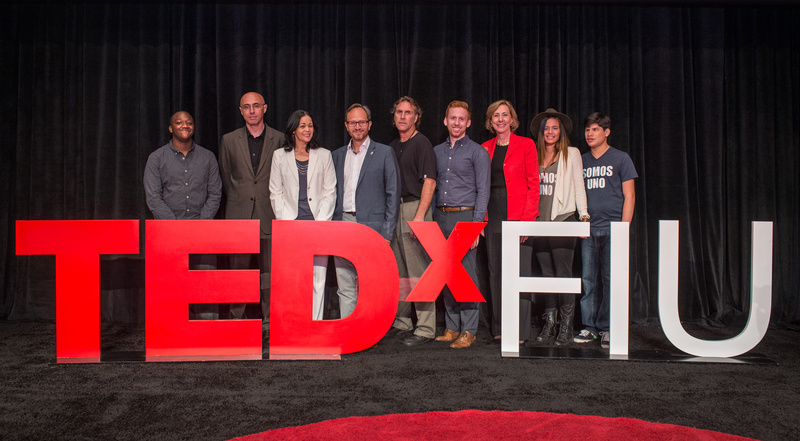 In preparing for TEDxFIU, the speakers worked with FIU speech coach Charlene “Char” Eberly. TEDxFIU Organizer Eddie Merille credits Eberly’s work as an integral part of the success of the event. “The whole process of being a speaker was amazing,” Kayser said. “Working with Char . . . was life changing.” She says this experience has motivated her to keep speaking motivationally to shed light on autism. If you’d like to watch the TEDxFIU 2015 talks again or you missed the event, the talks will be posted on FIU News and TedxFIU.com in December.